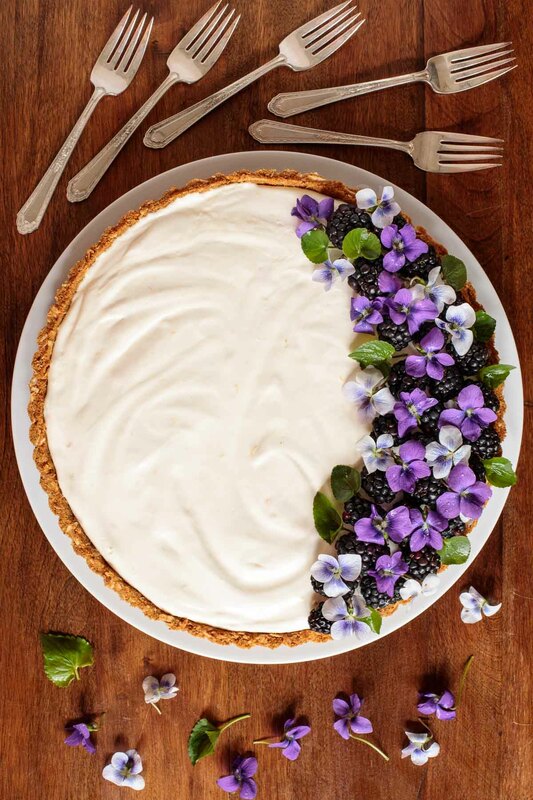 A modern update to the old-fashioned icebox torte, this Limoncello Lemon Tart is melt-in-your-mouth delicious – with a few fabulous gourmet touches! I tried a wonderful recipe for a Limoncello Tart from Olive magazine. It was delicious but, honestly quite a bit more work than I wanted to go through again. There was a classic pâte brisée crust that required rolling and blind baking as well as a fairly time-consuming filling, requiring a lengthy stint with a double boiler. Yes, definitely more work that I needed. So, I came up with my own Limoncello tart, this simple Limoncello Lemon Tart. Enjoy! I tried a few versions and am now thrilled to introduce you to The Café’s Limoncello Lemon Tart. It’s got a crunchy graham cracker/coconut crust and a bright, fresh, sweet/tart, silky smooth filling. I’m hoping that you’ll love it as much as we do! If you’re not familiar with Limoncello, it’s an Italian liqueur made from lemon zest, water, alcohol, and sugar. It’s generally made in southern Italy, particularly around Naples, the Sorrentine Peninsula, the Amalfi coast and on the islands of Procida, Ischia, and Capri. Limoncello is often served in cocktails and as a sipping treat for after-dinner, but it can also be a delicious flavoring option in a variety of recipes. We love this Limoncello syrup which has lots of different uses and takes just minutes to put together. 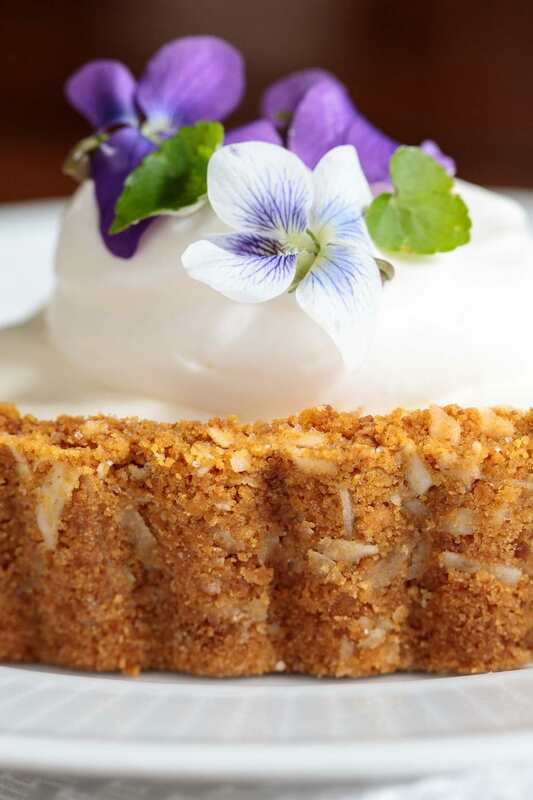 I’ve had friends describe this Limoncello lemon tart as a “lemon cloud” as it’s light (sorry, not in calories) and each bite seems to literally melt in your mouth. The “cloud” filling is simple: whipped cream, condensed milk, lemon juice and Limoncello – that’s it! This dreamy mixture is poured into a pre-baked graham cracker/coconut crust and popped in the freezer to chill. The crust for this lemon tart is about as easy as a crust can get. It’s a simple graham cracker crust, but a scoop of shredded coconut adds delicious flavor and a bit of extra texture. It’s a pat in the pan crust that can be made even easier with purchased graham cracker crumbs; if your time is limited. I love that, because this is a frozen dessert, it can be made in advance (up to a week ahead) making it perfect for dinner parties and get-togethers with family and friends. There’s no last-minute scurrying to make dessert with this wonderful recipe. We recently moved to the mountains of Western North Carolina. 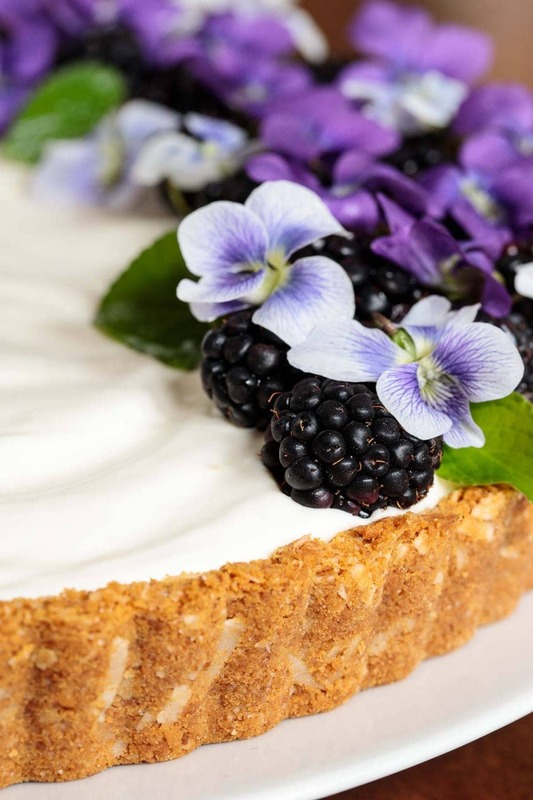 I was delighted, this spring, to find a whole hillside of wild violets growing right on our property, so I used blackberries and violets to garnish my lemon tart. You could also use pansies, violas, roses, etc (see this post for a list of common edible flowers) or fresh fruit as a pretty garnish. You’ll need an 11-inch tart pan with a removable bottom for this recipe. This type of pan is not expensive and can be used for lots of different recipes. Because the outside shell can be removed, it makes for a pretty presentation. 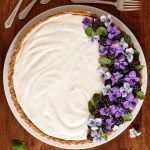 If you don’t have a tart pan and don’t want to purchase one, you could make this lemon tart in a 9-inch square or round cake pan. You’ll just need to make the side crust a little deeper to accommodate the filling. Prefer not to use Limoncello? No problem, just substitute 2 tablespoons of extra lemon juice for the Limoncello. Each serving of this Limoncello Lemon Tart contains approximately 1 teaspoon of Limoncello, so you don’t have to worry about anyone over-indulging in alcohol but, as I mentioned above, the Limoncello can be omitted. Don’t forget to grease your pan with cooking spray or oil before adding the graham cracker crust for easy removal. You can also line the pan with parchment paper. This lemon tart recipe calls for the finely grated zest of two large lemons. (If your lemons are small, use 3.) The “zest” of citrus fruit is only the colored part. You don’t want the pith included which is the white layer just beneath the outer color layer. The colored layer is delicious and full of flavor, but the pith can be quite bitter. An easy way to zest lemons (or other citrus fruits) is with a microplane zester/grater. They’re not expensive and are invaluable if you enjoy cooking and baking with citrus. Simply hold the lemon in your hand and run the zester across the surface (towards you). The fine zest will be collected in the trough of the zester and can be added to your recipe. 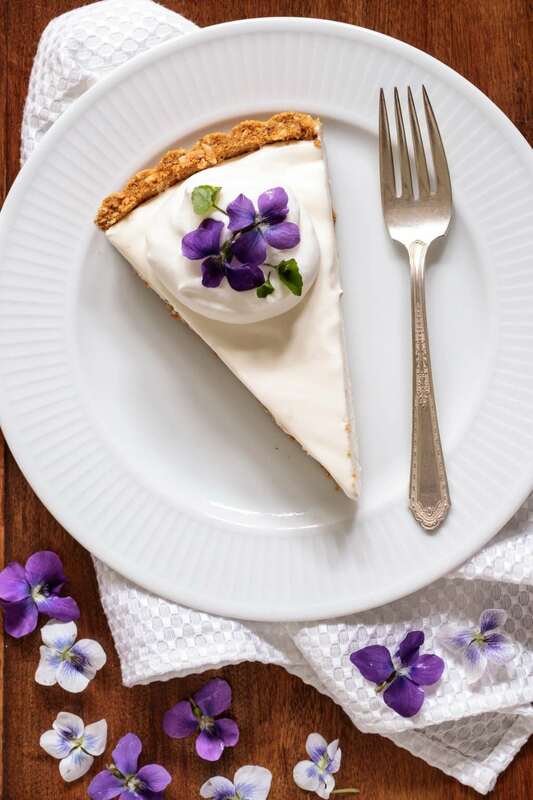 The graham cracker/coconut crust for this recipe can be made with crushed graham crackers or purchased graham cracker crumbs. I like to keep a box of the graham cracker crumbs on hand to make recipes like this even easier! We LOVE hearing from you! If you enjoyed this recipe, please come back and leave a star rating and review! It’s so helpful to other readers to hear other’s results and ideas for variations. A modern update to an old-fashioned icebox torte, this Limoncello Lemon Tart is melt-in-your-mouth delicious - with a few fabulous gourmet touches! Preheat oven to 350˚F. Spray an 11-inch tart pan with a removable bottom with cooking spray (or lightly oil). Combine graham cracker crumbs, coconut, sugar and melted butter in a medium-size bowl. Stir well until butter is completely incorporated. Transfer mixture into the prepared tart pan. Pat mixture firmly up sides of the pan forming a fairly thick edge. Pat remaining crumbs firmly and evenly across the bottom of the pan. Place tart pan on a sheet pan. Bake crust in preheated oven for 10 minutes or until light golden brown. Set crust aside to cool completely before filling. Whip the cream until soft peaks form when you lift the beater. Fold in the condensed milk, lemon zest, lemon juice and Limoncello. Spread the filling into the pan evenly, swirling the top a bit. Place in the freezer until firm, at least 3-4 hours (can be up to a week). 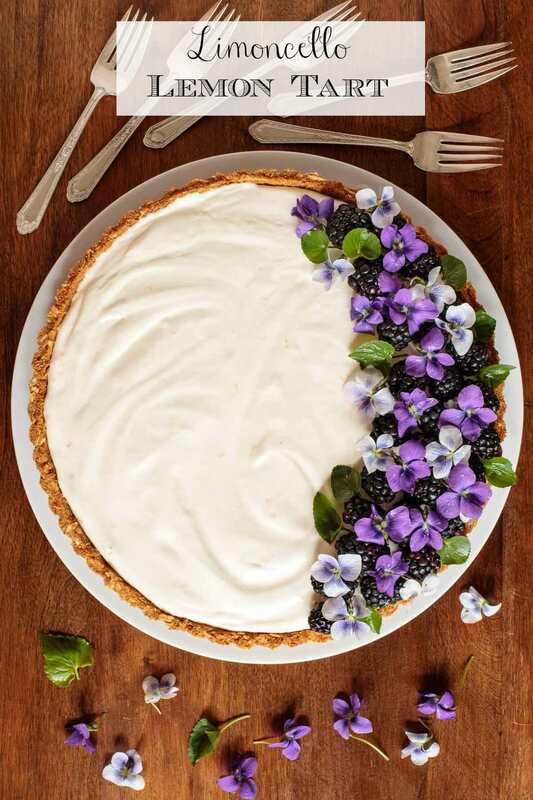 To serve, garnish tart with fresh fruit and edible flowers if desired. Slice and serve directly from the freezer. 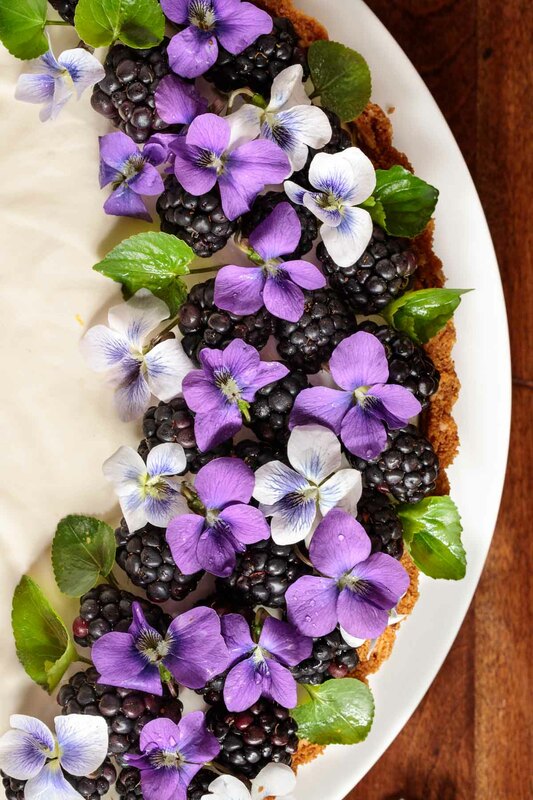 Serve slices with a dollop of whipped cream and more edible flowers or a thin half slice of lemon and a sprig of mint. See Café Tips above in post for further instructions, more detailed tips and other baking pan options. Absolutely stunning, Chris! A frozen dessert is so great for entertaining and especially when it’s as delicious as this one 🙂 Anxiously awaiting my little violets. They are still covered with a little snow just yet, but soon! Such a beautiful presentation! Looks yummy!! Can I leave out the coconut in the crust? Thank you for the wonderful recipes that you share with all of us. Thank you, Cathy! You could definitely leave out the coconut. I would use just a little less of the melted butter though. Or, you could add a few more of the graham cracker crumbs. Enjoy! I would love to try this but my husband was recently diagnosed with Celiac. Any thoughts on a gluten-free crust, maybe we almond flour? Made this today and it’s in the freezer for tomorrow. Of course I had to taste the filling and wow, is it good! It’s definitely going to be on our table on Easter. Thank you for your terrific recipes! Yay! I always love it when I get a comment from the first “real” person who tries a recipe! So happy you like it, Norma. Thanks for taking the time to share your results. Have a blessed and delicious Easter! Thank you, Chris. Just to update you this tart was a hit with everyone. I got requests for the recipe, thumbs up and some “thanks for making this for us”. My new favorite go to dessert. I love limoncello and follow your blog regularly, you do such a great job. This limoncello tart is definitely going to be on my dinner table this spring and summer!!! Thanks so much, Elizabeth. Hope you enjoy it as much as we have! Is there a brand of limoncello that you prefer over others? How beautiful Chris! You may remember… I love Limoncello so this is definitely my kind of recipe 🙂 I bet it’s very refreshing and perfect for the upcoming holidays. Bravo! I’m in love! Such a beautiful presentation! Easter has never been this easy. Thank you!! OMG! What a GREAT recipe with Easter next Sunday!!!! Can’t wait to make this & bring it to our Easter brunch!!! Thanks, Marilynn! I love your enthusiasm! Have a lovely Easter brunch! Can the crust be made with a gluten free graham cracker? This is picture perfect and I love that there is coconut in the crust. I have a rectangle tart pan with removable bottom that I seldom use and it would be great for this luscious dessert. Thanks so much for sharing! Thank you, Sandra, I hope you enjoy it! I have a bottle of limoncello that has been waiting for this gorgeous dessert!! Perfect for Easter! Thanks, Liz! It would be a lovely Easter dessert! This looks so beautiful and I love anything lemon! Can this possibly be made with something other than heavy creme to lower the calorie count? Such a gorgeous tart! I love limoncello – what a fab way to enjoy it!